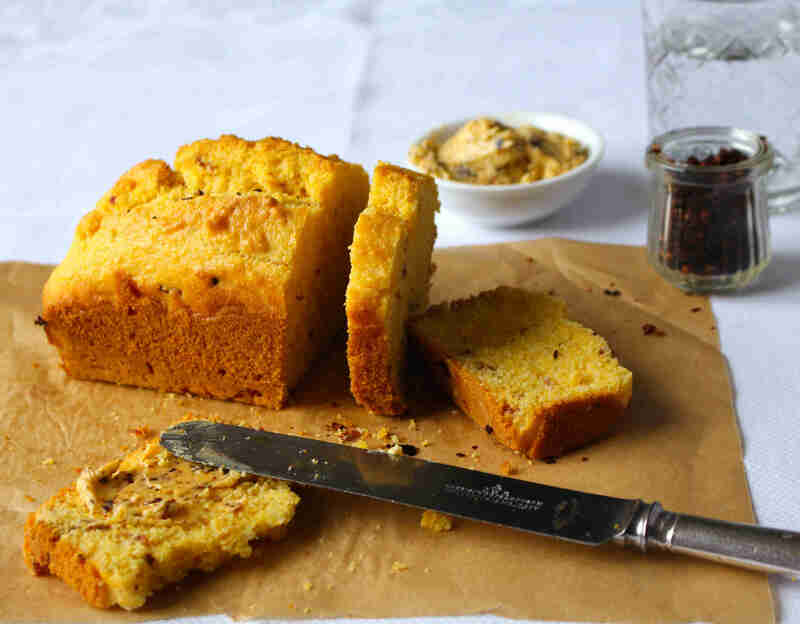 Corn bread is incredibly simple to make, but with great flavour pay-off, and fantastic served warm and slathered in butter. Perfect for the home cook who is running short on time! 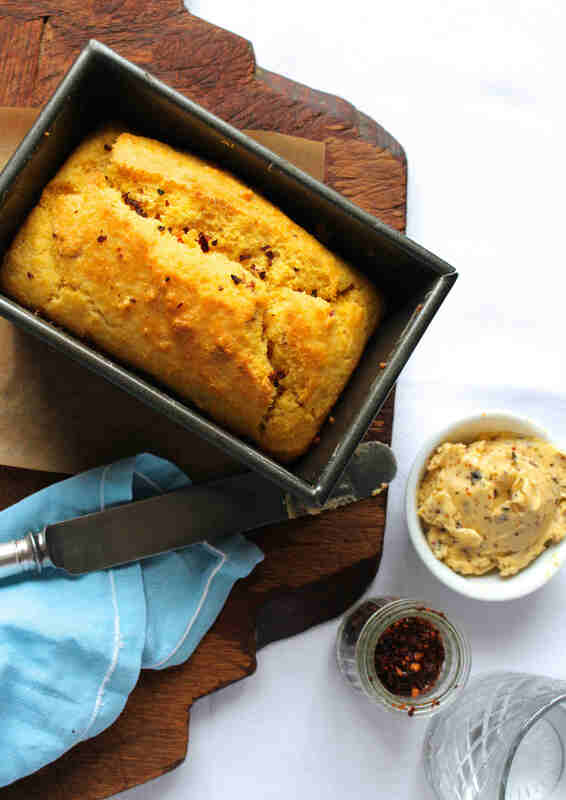 The bacon dust is there to provide the merest hint of salty bacon flavour to the loaf, but you can omit this and leave the corn bread plain if you prefer. For this recipe, I use our Shipton Mill maize grits, combined with T55 bread flour to lighten the bread and make it less dense. Maize grits have quite a bit of bite to the texture (as you would expect) – if you want to tone this down, soak the maize grits in the milk for a couple of hours before you start baking. Remember to keep tasting the butter so that you can adapt the levels of heat and sweetness to your liking. I used smoked chipotle chillies from Waitrose, which have been dried and ground into a powder. If you have whole chipotle chillies, you can grind them into a powder yourself using a pestle and mortar, so that they can be combined into the butter with ease. You can find our Shipton Mill organic maize grits online here. Grill the bacon until crispy. Set it to one side to cool, then use a sharp knife to chop it into tiny pieces of bacon dust. Preheat the oven to 220°C. Grease a 450g loaf tin. In a large mixing bowl, soak the maize grits in the milk for 20 minutes or so (you can leave it for longer if you have time). Add the rest of the wet ingredients to the mix. Then add the flour, baking powder, salt, and sugar, and combine to make a wet and runny mixture. Lastly, stir through the bacon, and pour the mixture into the loaf tin. Bake for 20-25 minutes. Insert a metal skewer into the middle of the bread. If it comes out clean, the bread is baked. Leave it to cool in the tin. To make the chipotle butter, whip the butter in a small bowl with the maple syrup and crushed chipotle chilli using a fork, until it is thoroughly combined. Taste, and add more chilli or maple syrup if you think it needs it. This loaf is best eaten on the day of making. Serve warm, with an extra drizzle of maple syrup for the sweet of tooth!